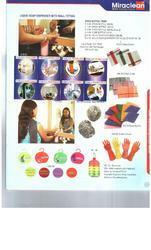 Manufacturer of fragrant sanitary disposable bags, hand sanitizers etc. Water proof covers ( patent pending) are made with maplitho paper complete sealed with heat process. We can supply any size with printing of the company's name according to gsm of the paper preferred. They are water proofed by poly coating strength. Fragrant sanitary disposable bags (patent pending) is very easy to dispose the used sanitary pads and put it any dust bin instead of flushing pads in w/c which may cause drain blocks. The product is 100% biodegradable and leak proof it has self sealing facility which protects from the spread bacteria, corossion and diseases.